Located in Decatur, Super 8 by Wyndham Decatur/Lithonia/Atl Area is a 5-minute drive from Dekalb Medical Center at Hillandale and 7 minutes from Southeast Athletic Complex. Featured amenities include a 24-hour front desk and coffee/tea in a common area. Free self parking is available onsite. Located in Decatur, Econo Lodge is within a 15-minute drive of Georgia Regional Hospital and Northlake Mall. Free self parking is available onsite. 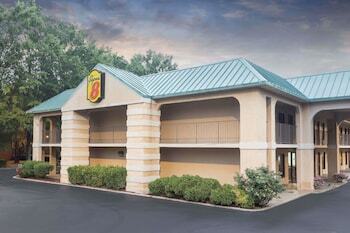 Located in Decatur, Affordable Hotel is within a 15-minute drive of Georgia Regional Hospital and Buena Vista Lake. Free self parking is available onsite. With a stay at Americas Best Value Inn - Stone Mountain / Atlanta East in Stone Mountain, you'll be within a 15-minute drive of Northlake Mall and Art Station. Free self parking is available onsite. With a stay at Knights Inn Atlanta East in Tucker, you'll be within a 15-minute drive of Emory University and Northlake Mall. Free self parking is available onsite.